Unless you happen to know something about information technology and computer systems, you might not be familiar with the phrase “cloud computing.” Apparently, it has nothing at all to do with using a computer while high in the air. It's not a way of describing a lack of visibility at your desk. Cloud computing has to do with making use of online business applications and other services, and storing the information created on servers that are also accessed through the internet. In the near future, so we're told, businesses and enterprises will move more or less completely from using software physically placed on every employee's computer to applications and services accessed through a web browser. Similarly, as reliability and security improve, they will move from storing information on servers inside their physical buildings, to storing it on off-premies servers also accessed online. The whole thing's very technical and, frankly, quite a bit beyond me. But I get the gist of it; the point for businesses is that cloud computing is theoretically more cost-effective, more flexible and adaptable, and more scalable – that is, it's able to handle growing amounts of work efficiently. Instead of employees being tied to their desktop computers, they can work with available hardware wherever they have an internet connection. I know very little about the advantages and disadvantages of such a model for business. 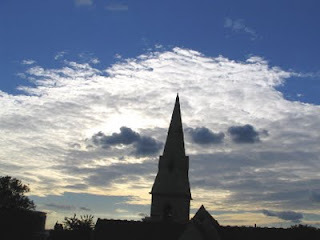 It occurs to me, though, that the cloud metaphor works for the church, as well. As is true with many ideas, this one might be better understood by comparison with the way most of us currently think about and “do” church. For most of us, church has to do with a place (the place where our church services or assemblies or meetings or whatever we call them happen) and a time (the day(s) and hour(s) of those services, assemblies, and meetings). Oh, we can talk about not going to church but being the church. Some of us can say that we belong to churches that meet in buildings that they don't own. Still, if someone asks you about your church it probably won't take long before you're thinking of a building and the worship service going on inside it. We come by that honestly. We've been conditioned since at least the fourth century, when Emperor Constantine made Christianity the state religion and turned over buildings and property to the church, to associate church with time and place. So the next time you're yelling at your kids to get dressed because “it's time for church,” try to remember that there's a Roman emperor to thank for that. As if, for Christians, it's ever not time for church. That's why the more I think about it, the more I like the metaphor of the church in the cloud. It's truer to our nature to break the connections we've assumed for a millennium and a half between church and a particular address and time. It's truer to the nature of the One whose name we wear. Some of the first disciples discovered that from the moment they met Jesus. “Where are you staying?” they asked, and Jesus shot back, “Come, and you will see.” He warned another prospective disciple that he had “no place to lay his head.” And if Jesus didn't imagine that he could do his work boxed up inside a building or a worship service, why do we imagine that we can do his work that way? When Paul wrote his letters to churches, he didn't even bother to try to put street addresses on them. They were addressed to “all in Rome who are loved by God and called to be his saints.” To “the church of God in Corinth, together with all the saints throughout Achaia.” To “the churches in Galatia” and to “all the saints in Christ Jesus at Philippi.” Those Christians met in houses and public halls and who knows where, and they had enough to do with each other that when Paul wrote them a letter, you'd better believe it got passed around. What do you think might happen if the church adopted this “cloud” thing and consciously broke the connections that tie us to a physical location? What would it look like, for instance, if we learned to do community in the cloud? For one thing, we'd figure out how to be in each other's lives all the time, not just on Sundays when we all showed up at the same place. We'd find ways to be together, to pray together, to worship together, and to share each other's struggles. Our community would come from our being connected to each other through the work of God, through Jesus, in the Holy Spirit, and not attendance at the same event. Or what might ministry look like in the cloud? For starters, it would bubble up from the interface between the Holy Spirit and the talents, passions, and priorities that each of us have. It wouldn't be necessary to waste time and energy persuading people to be a part of this or that ministry. Instead, the church as a whole would be asking itself how to support, encourage, and resource one another in the ministries to which we were called by the Lord. And leadership in the cloud? It would have less to do with institutional maintenance, and more to do with spiritual formation, preparing God's people for ministry, building up the church in faith and knowledge, and helping them to maturity in Christ. (Ephesians 4:11-16) Leaders would facilitate the connections between the church and the Lord, and between one another. They wouldn't need to be decision-makers and permission-givers, but could fulfill their God-given responsibilities as teachers, mentors, and protectors. Our “cloud,” of course, is the work of God, the person of Jesus, and the presence and power of the Holy Spirit. Wherever we are, whatever we're doing, if we're connected with the Father, Son, and Spirit we are the church, along with all those everywhere who call on his name. Our identity doesn't depend on a time and meeting place; it has to do with what Jesus has done for us and the presence of the Spirit in us and among us. A building is a convenience, a tool. A scheduled worship service is the same. But let's begin thinking and praying about how we can leave those conveniences behind when it better suits the work we've been given to do, and get back to the essentials of who we are: God's people, connected to the Lord and to one another. The Church in the Cloud.